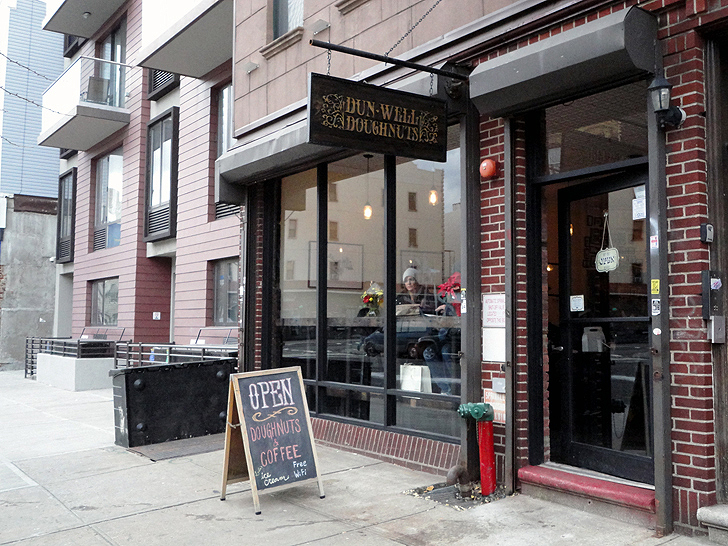 Less than two weeks ago, the neighborhood between Williamsburg and Bushwick became a little sweeter. An old timey donut shop opened on Montrose Avenue, but this is no ordinary shop. Dun-Well Doughnuts is a premier vegan donut shop, complete with gourmet flavors, fresh coffee, bowtied workers, and jazz music. Sure, vegan donuts are available in most organic delis in New York, but most lack flavor, coming only in plain “cake.” Enter Dan Dunbar and Christopher Hollowell, the brains behind Dun-Well (get it? “Dun-Well” is a combination of Dubar and Hollowell). The duo has been baking scrumptious vegan donuts and distributing them to sparse retail locations across lower Manhattan and Brooklyn, selling out quickly. Now their delicious varieties can be found in one place — their new flagship shop in Brooklyn. A step into the Dun-Well Shop is a step back in time. The walls are clad in vintage baking advertisements, recipes and sheet music. Edison lightbulb fixtures hang from the vintage textured tin ceiling, old seltzer bottles and baking tins decorate the back wall, and 1920s-jazz croons over the speakers. Customers can enjoy their coffee and donuts in-store, while checking their email with the free Wifi. The shop is quaint and comfortable, but the real star here is the vegan eats. Dun-Well’s donuts are not just for breakfast, but instead a gourmet dessert. Flavors like French toast, almond coco joy, green tea & ginger, chocolate candy cane, and s’mores cozy up with traditional flavors like Boston cream, jelly-filled, and classic glaze. The cast of flavors change daily, for new and exciting offerings to try. Any of the sweet flavors can be topped with a scoop of Lula’s vegan ice cream, for a decadent donut sundae. Since its opening December 6th, Dun-Well has consistently sold out of their vegan goodies by early afternoon, already becoming a neighborhood staple. The customers want more, and Dun-Well is slowly figuring out just how many to make each day. They’re excited to bring their delicious ethical donut flavors to vegans and non-vegans alike. Sure, vegan donuts are available in most organic delis in New York, but most lack flavor, coming only in plain “cake.” Enter Dan Dunbar and Christopher Hollowell, the brains behind Dun-Well. The duo has been baking scrumptious vegan donuts and distributing them to sparse retail locations across lower Manhattan and Brooklyn, selling out quickly. Now their delicious varieties can be found in one place -- their new flagship shop in Brooklyn. A step into the Dun-Well Shop is a step back in time. The walls are clad in vintage baking advertisements, recipes and sheet music. Edison lightbulb fixtures hang from the vintage textured tin ceiling, old seltzer bottles and baking tins decorate the back wall, and 1920s Jazz croons over the speakers. Customers can enjoy their coffee and donuts in-store, while checking their email with the free Wifi. The shop is quaint and comfortable, but the real star here is the vegan eats. Dun-Well’s donuts are not just for breakfast, but instead a gourmet dessert. Flavors like French toast, almond coco joy, green tea & ginger, chocolate candy cane, and s'mores cozy up with traditional flavors like Boston cream, jelly-filled, and classic glaze. The cast of flavors change daily, for new and exciting offerings to try. Any of the sweet flavors can be topped with a scoop of Lula’s vegan ice cream, for a decadent donut sundae.